It’s very odd to read an article that speaks about nuclear power without mentioning the neutron. 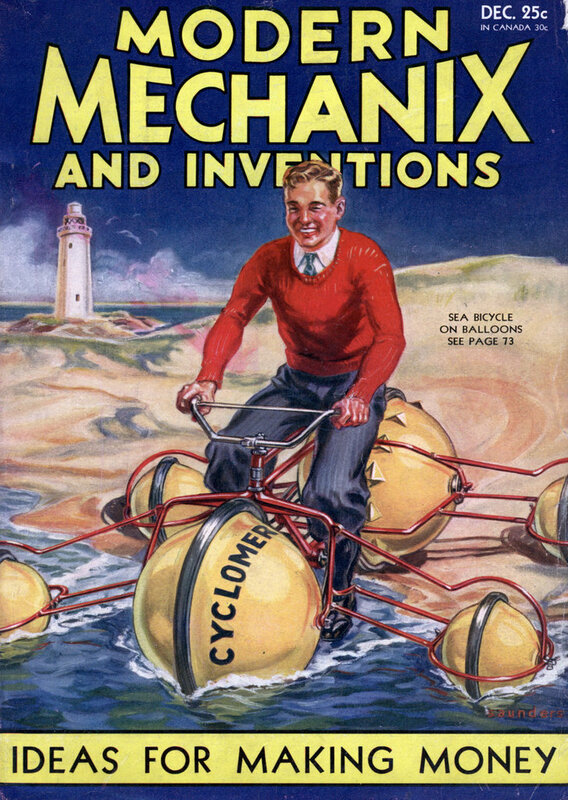 In fact the neutron was proposed by James Chadwick the year this issue was printed. Locked up in the atoms which make up all matter are tremendous stores of energy which, if harnessed, would yield millions of horsepower at a negligible cost. Read here about amazing advances made by science in its attack upon the atom and about the feat, recently achieved, of actually changing mercury into gold. IF SCIENCE succeeds in its current quest for a means of splitting atoms on a mass-production scale, and thus making it possible to utilize the tremendous energy bound up in the electron and proton, all the machinery which now furnishes our power may be thrown into the junk heap. People of a hundred years hence may regard the prime movers of 1932 with the same amusement with which we regard the crude weapons, carts, and fire-making apparatus of primitive men. Instead of the bulky, wasteful machines which we employ today, the people of 2032 may have engines, powered by energy liberated from atoms, that will be so efficient and powerful that a piece of coal the size of a pea will suffice to drive a giant liner like the Mauretania across the ocean and back. Although an opening wedge has been driven into the atom with high voltage machines recently devised, a long, hard road lies ahead of the scientists before they attain their goals. At the end of this road may lie not only the production of power at an amazingly low cost, but also a realization of the age-old dream of the alchemistsâ€”the creation of gold from base metals. Transmuting one chemical element into another by splitting atoms and adding or subtracting a portion of their protons and electrons has already been accomplished, and it now remains to perform this feat on a large economical scale. Success, which probably lies far in the future, may mean that gold will become as plentiful and inexpensive as substances like lead and iron. It is what might be called the “compact looseness” of the atom that defies all attempts to smash it. These atoms are composed of a central nucleus made up of a group of electrons and protons, around which revolve like a planetary system an array of orbital electrons, as you see illustrated in the drawing at the top of the page. The protons are positively charged, while the electrons carry a negative charge. The opposing polarity of these two bodies in the atom is what holds them together, resisting with herculean strength all attempts to break them apart. Now the entire universe is made up of 92 chemical elements, which are in turn composed of electrons and protons, sometimes termed by scientists the “building blocks of the universe.” The character of each element is determined by the number of protons and electrons in its nucleus and the number of electrons revolving in orbits around this nucleus. Hydrogen, the element of the lowest atomic weight, has one nuclear proton and one orbital electron. Next comes helium with four nuclear protons and two orbital electrons. And so on up through the list of elements to the heaviest, uranium, which has 92 electrons describing orbits around a nucleus having 238 times the weight of the hydrogen neucleus. In each element the positive charge on the nucleus is exactly counterbalanced by the negative charges of the electrons. In splitting up the atom and thereby liberating the tremendous electrical charge which it contains, the problem of scientists is to drive a projectile with enormous force and speed into these nuclear protons and break them up into two or more groups; that is, into two or more atoms, thus effecting a transmutation. Two types of “guns” capable of shooting electrical bullets into the nucleus of the atom have proved practicable on a small scale. In early experiments “radium guns” were aimed at simple elements like hydrogen, nitrogen, and lithium. Radium is constantly disintegrating, and in doing so it shoots out helium nuclei or alpha rays. These bullets were found quite capable of stripping off electrons from simple elements with few orbital electrons like helium and lithium, but they couldn’t penetrate to nuclear protons of heavier elements like mercury and lead. In addition, this method of atomic disintegration proved far too costly. Results in liberated energy were not worth the price paid in radium. Abandoning the radium guns, experimenters are now devising high voltage vacuum tubes to furnish the projectiles with which to penetrate the atomic nucleus. 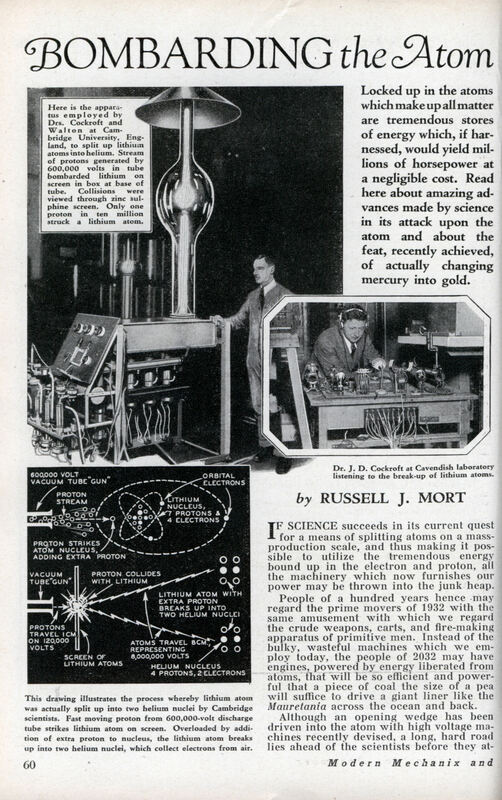 Most noteworthy among these experiments is the atom-smashing feats performed by two British scientists, Dr. J. I. Cockroft and Dr. E. T. S. Walton, who have succeeded in splitting up an atom of lithium into two atoms of helium, thus, it is believed, inaugurating the era of atomic energy engines and foreshadowing the day when gold will be made from base metals. The “gun” which shot the “bullets” to bombard the lithium atoms was a special vacuum discharge tube, operating at a potention of from 120,000 to 600,000 volts. This enormous voltage generates a stream of fast-moving protons which are directed along a glass tube in which a screen of lithium is placed. Traveling at a speed of 4,000 miles per second, these protons impinge on the lithium atoms on the screen and break up each nucleus struck into two helium nuclei. The process of transmutation, illustrated in an accompanying drawing, was as follows: The lithium nucleus contains seven protons and four electrons. When struck by the proton generated in the vacuum discharge tube, an extra proton was added, causing the overloaded nucleus to split up into two parts, each containing four protons and two electrons. Now it so happens that this quantity of protons and electrons constitute a helium nucleus, so that two atoms of this element were created from an atom of lithium. What is of immense interest to the world, because it points the way to the utilization of the power bound up in the atom, was the fact that for each atom shattered in the experiment, energy amounting to 16,000,000 volts was liberated. And this from an expenditure of only 120,000, to 600,000 voltsâ€”the potential at which the tube was operated. This 16,000,000 volts represents the energy liberated upon the breaking up a single lithium atom. The lithium atom has a certain weight, but the combined weight of two helium atoms is not equal to the weight of the former atom. The loss of mass, scientists deduce, represents the generation of the 16,000,000 volts. In the chronicles of laboratory experimentation upon the atom, nothing more startling has ever transpired. Successful as this astounding experiment was, there was a snake in the scientist’s paradise. Bombard the lithium atoms as they would, they could succeed in making only one hit in each ten million protons fired from the high-voltage vacuum tube. Thus the energy is released only once in every 10,000,000 attemptsâ€”a very low efficiency. But although the experiments did not succeed in unlocking the energy on a mass-production scale, they at least pointed the way to the goal. A tremendous stride towards the objective of unleashing the vast energies of the atom has very recently been taken in Germany by two eminent scientists, Drs. Fritz Lange and Arno Brasch. The advance made is indicated in the fact that where Cockroft and Walton succeeded in making one hit in ten million, the Germans pulverized millions of atoms, extracting four times as much atomic energy as was injected in electrical energy. Overthrowing all physical laws, the experimenters transformed aluminum into helium, and split the atoms of four other elements in additionâ€”boron, sodium, beryllium and lithium. Many eminent physicists hold the feat of atom-smashing to be epochal, a prelude to releasing the vast stores of energy held within the most minute particles of matter known to man. In addition, the day when base metals will be transmuted into gold is brought a day nearer. Not satisfied with their present accomplishment, the Germans have now under construction a super-generator which they hope will smash atoms by the billions. Although details of the experiment is kept a closely guarded secret, it is known that the chief weapon employed in the attack upon the atomic nucleus was a 5,000,000 volt X-ray tube, operated at half power, or 2,500,000 volts. To an American physicist, Dr. Coolidge, of the General Electrical Co., goes credit for designing the tube, or rather tubes, for several are used together in cascade formation. This scheme is made necessary by the intensity of the rays, which penetrate even the insulation. Swiftly upon the heels of this feat has come another piece of news which has set the scientific world agog. A young German scientist, Heinz von Bohndorff, hitherto unknown, claims to have actually made pure gold from mercury, thus realizing the ancient dream of alchemists. This feat of transmutation was accomplished by the use of a million volt cathode ray tube, the current for the step-up transformer being furnished from ordinary house current. A quantity of mercury was exposed to a bombardment of protons from the tube for a period of forty, hours, at the end of which time analysis revealed that each atom of mercury had been split into one of gold and one of hydrogen. A magnifying glass brought to bear upon the vial holding the erstwhile mercury revealed numerous glittering particles of the precious metal lying amidst a quantity of gray ashes. The weight of the yellow metal created was found to be .0008 grams. A group of outstanding German scientists examined the gold and declared it genuine. Turning mercury into gold would mean changing one proton into a neutron. Bombarding mercury nuclei with protons seems a bit of a wrong-headed way of doing that. You’d be more likely to make thallium, which has one more proton than mercury, but is even less pleasant company! Since I can find no references to the pioneering Herr von Bohndorff on the Internet, I think he was probably making it up. 0.0008 grams of gold is about 2.4*10^18 atoms. If the efficiency was even ten times better than Cockcroft and Walton’s, at one part in a million, he would have had to make more than 2*10^24 attempts at transformation. Two million million million million protons each accelerated across a million volts is an awful lot of current! A few years later, in 1934, a German film is made that features a gold making machine. Had they read this article, they would have had mercury as the raw material. Years later, stock footage from the 1934 film is used in the 1953 film “The Magnetic Monster”. Many years I searched for Heinz von Bohndorff, who was a friend of my father in the early thirties. He had a labaoratory in the north of Berlin and a firm in the city. My father has done some mechanic work for him. Bohndorff was jewish and had to escape from Germany. His last message (without an adress) to my parents was from 1934 . I’m extremly interested in this person.